Flooring is the foundation of any room – once you find the perfect floor, everything else just seems to just fall into place! However, selecting flooring can be overwhelming, as there are so many choices. At Sparkle Floors and Carpet, we understand and we are here to guide you through the process of deciding which flooring is best for you. The two most important things when selecting flooring is defining the use of the room and pleasing the palette of the people who will spend the most time in the room you are looking to change the flooring in – and asking questions is the best way to find out the information you need to make a decision. The first question we ask is “What is the room used for?” Is the room more for adults, or more for children? 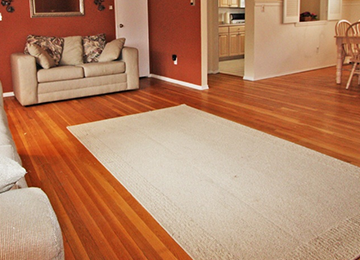 For example, if it is a high traffic play room, then we would recommend a good hardwood or a curable carpet. If it is a more formal room, we could look at a variety of woods or a more elegant looking carpet. The next question is – what is the color palette of the room? It is is a new room, then you can choose whatever color you wish and then match the wall and furniture color to the flooring. However, it it is an existing room, then the color palette used to make the decision about the flooring needs to be the wall and furniture color already in the room. If you are the main person to use the room, is there an inspiration piece? Is there a lamp, or a chair that has a particular color that you really love? How will the color of the flooring meld with the color of the flooring in the adjacent room? What is on your floor truly is the foundation of your entire room. Let us help you through the decision making process. Stop by our showroom at 451 South Ave in Scotch Plains. We can talk you through what options might fit your home and lifestyle the best – and you can take samples to see how they will look in your home!